A highly innovative product in the sector of stiff tube fittings that is meant as the real alternative to welded and threaded fittings for high pressures. Hexafluid, young and dynamic commercial reality headquartered at Costa Volpino (Bergamo, Italy), has released on the Italian market PYPLOK fittings, a highly innovative product that allows implementing with extreme simplicity tubing and piping lines up to 640 bars, preventing any leak risk. Of aeronautical derivation, PYPLOK system grants all the benefits of a welded attachment annulling the inherent risks and costs. Thanks to a compact-size portable tool, PYPLOK fittings undergo a cold forming and they are so definitively swaged on tubes. Such process generates a controlled alteration of the tube diameter, thus creating a permanent junction that represents the real alternative to welding: it does not provide for spark propagation, it does not need cumbersome equipment and specialized team, protection gases or radiographies are not necessary, pickling and fluxing are no longer required and definitively no contaminant agent will ever get in contact with the flowing fluid. The core of PYPLOK fitting is the special sealing system with 2 O-rings for each tube side, available in Viton or EPDM, to be compatible with the fluids used in most of applications in hydraulic ambit. The really revolutionary aspect of PYPLOK is its possible combination both with NPS tubes (ex. 1″ = 33.4 mm, typical of the applications with welded fittings or with SAE/CETOP flanges), and with OD tubes (ex. 1″ = 25.4 mm, characteristic of the applications with double ogive fittings), besides metric tubes (ex. 38mm, typical of the applications with single-ogive fittings or DIN 2353 weld taper ), making it the most versatile solution among junction systems for stiff tubes. 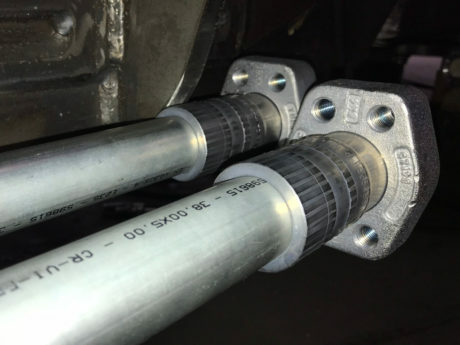 The range of fittings – made of carbon steel, stainless, duplex, superduplex and cupronichel steel – is composed by numerous intermediate figures as well as by terminals compatible with the most diffused fitting series, like DIN 2353 (24°), SAE J514 (37°), SAE J518 and ANSI flanges, with the possibility of implementing special figures upon customers’ specific requirements. Through a fast and functional assembly procedure, you obtain a notable time saving during both the first installation and any eventual modification or upgrading of a pre-existing plant. Times range from 10 seconds needed for the assembly of a DN10 (3/8” NPS) fitting to 30 seconds for a DN40 (1”1/2 NPS) fitting: numbers that highlight the absolute superiority of this technology if compared with the times needed for the installation of a standard welded fitting with the same diameter. The core of PYPLOK fitting is the special sealing system with 2 O-rings for each tube side, available in Viton or EPDM, to be compatible with the fluids used in most of applications in hydraulic ambit. This very fast operation occurs by means of a specific tool that converts a linear force into a radial force, pressing the fitting and making it a single whole with the tube. The result is a junction with extraordinary mechanical properties, including high resistance to tensile stress. 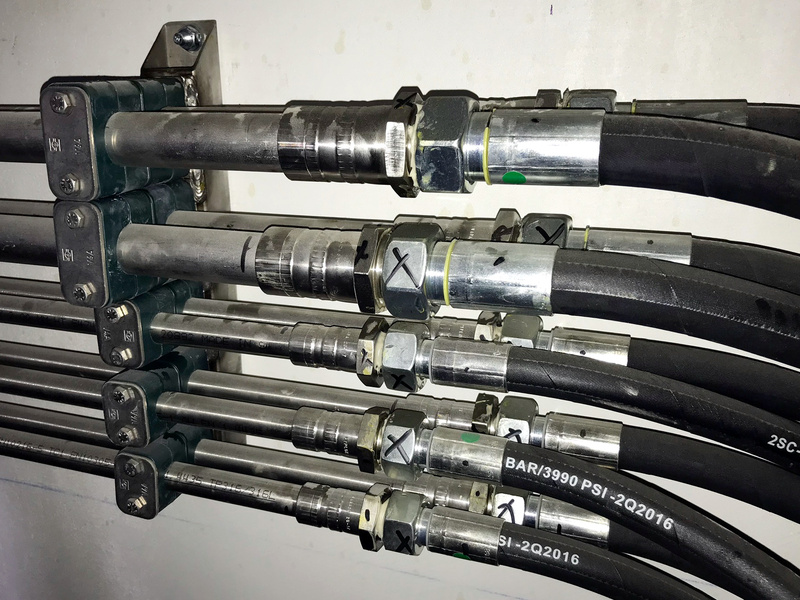 The portable tool can be powered by any hydraulic pump, manual, electric or with batteries, making the PYPLOK system perfect for uses under extreme conditions, too. A simple control gauge accompanies the installer for the entire process duration, starting from the tube setup up to the final inspection that – through the check of the reduction of the external body diameter – confirms the successful pressing. In pre-manufacturing phase in workshop, or for short and scarcely articulated piping, it is also possible to make use of a standard press for the hose connection, setting up the pressing diameter related to the chosen fitting. At the end of installation operations, PYPLOK stands out as the solution that grants the best cleanliness degree inside tubes because all operations are cold-executed, without the need of using any lubricant or anti-seizing. PYPLOK has received the approval by numerous members of IACS (International Association of Classification Societies) such as ABS, DNV, BV, LR, RMRS, CCS and CLASSNK. In the agricultural machine sector, it has already been chosen by various manufacturers, among which stands out Pezzolato Spa, which has preferred Pyplok fittings for its Allroad self-propelled drum chipper.